Here are a few steps to try and see if it helps resolve things for you! Make a log in attempt. There will be an error message that shows up right under the Password field. If the password is wrong, please go here and click on Forgot Password. Enter the e-mail that is associated to your Convo number. The same goes to your phone number if you've forgotten it - click on Forgot Number. If you're on iPhone 4 to 8, quit by double-pressing the home button in rapid succession and then swipe up the Convo app. If you're on an iPhone X and later, pull up the drawer by swiping up right next to the Home Bar to show the background apps. If you are still having trouble, reboot (restart) your phone and/or remove and re-download the app. Please contact Support if you are still having issues. The first thing you see after logging in! You will be greeted by the main screen that includes a mirror of yourself (A), which is a convenient self-check before making calls. At the top, you will see your number on the left side and the option(s) to switch between ENG / ESP (C) plus the toggle button for VCO on the right side. If you do not see ESP, it is because you have not enabled VRS Espanol yet. Below these options rests the Search field. At the bottom of the screen, you will see a dock (B) containing five major features; Dialpad, Contacts, Calls, Ecosystem and Help. There is no other better way to connect to the whole world out there! Tap on the Dialpad button at the bottom. It is green-colored and the icon resembles a nine-dotted puzzle. 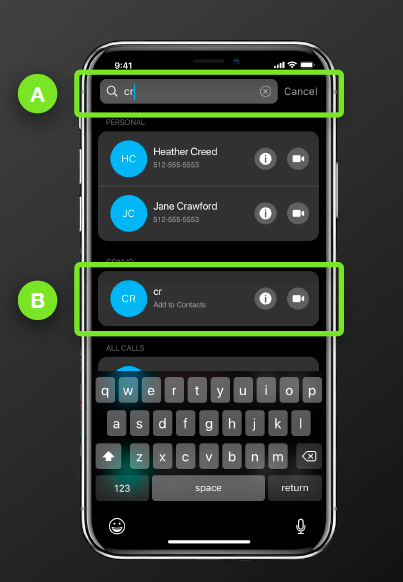 If you want to make a call to an existing contact, there are two ways to do it; you can type their name in the Search field at the top (A) , OR go in the Contacts list and swipe to the right (B). To make a traditional call by dialing a number manually, tap on the numbers on the Dialpad and then tap the green Call button at the bottom. NEW! 911 now has a speed dial. 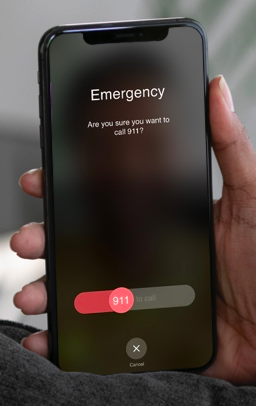 If you need to make an emergency call, tap on 911 and you will be taken to the next screen where it requires you to swipe all the way to the right to confirm. This feature is there to prevent misdialing. The main interface of the in-call window. At the top, you will see the number OR the name of the person (B) you're speaking to, including a mini selfie window (A). You can drag the selfie window to a desired position. 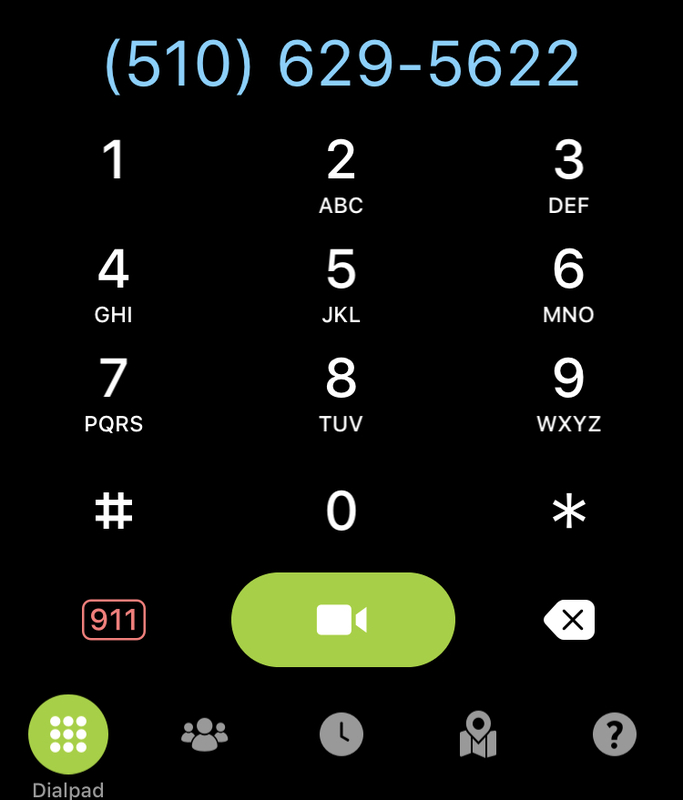 Tap on the center of the call window to bring up the Hang Up slider. This will be elaborated in its own paragraph. At the bottom, you will see a dock with five buttons (C); Dialpad, Contacts, Calls, Text Chat and Settings. If your phone's screen orientation is unlocked, you can rotate into the landscape position; the name/number & hang up button will be moved to the left side and the dock will reposition itself to the right side of the screen (A). Their functions remain the same. If you wish to make another call with the same interpreter after the caller on the other end hung up OR you hung up, press on the Dialpad. It will connect your current VI to the next call. You can also use this to navigate through a phone tree. If you are in middle of a call and wish to share contact details with the interpreter, you can press on Contacts and select the one you want to share. If you wish to view your call history, copy a number or call back while you have your interpreter on screen, press Calls. To see the VI's number, and to see what they typed to you & you write to them, press on Text Chat. The icon resembles a chat bubble with horizontal lines on it. Lastly, in the Settings interface, you can do many things here. It brings up an overlay with lots of features. You can toggle VCO, video privacy and lights. 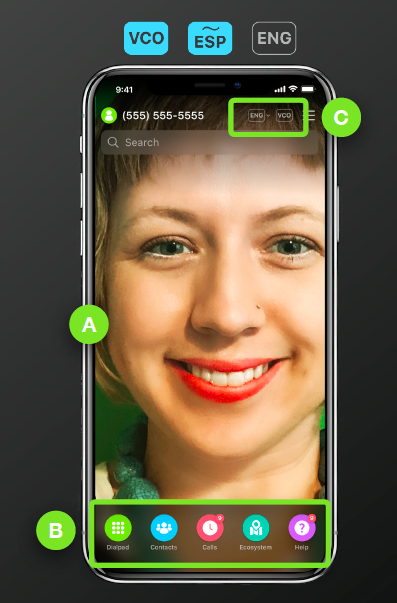 The ability to flip the camera, reposition the Hang Up slider and zooming in/out the in-call screen are also in there. One of our newest additions - the simplest hang up experience you'll ever have! The slider has two functions, and it depends on how far you slide the phone button. It will hide by default, but if you wanted to hang up a call right away, simply tap the center of the screen and it will show up. 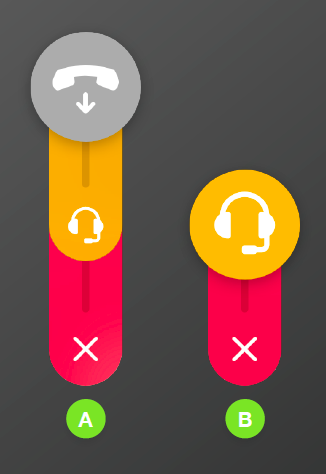 Sliding the button halfway down (when you run out of yellow) & releasing will keep the interpreter and hang up your call with the hearing person (A). Sliding the button all the way down (when you run out of red) & releasing will terminate the entire call itself (B). 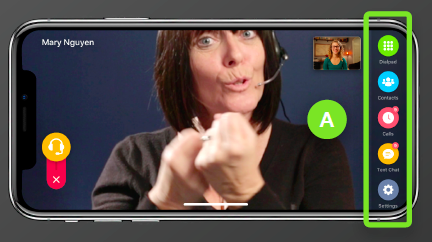 A quick tutorial on becoming an expert with our app for Videomail! Tap on the Calls button at the bottom. It is red-colored and sits in the center with an icon that resembles an analog clock. Tap on the Videomail button. The icon looks like a mailed letter with a camera attached to it. To view the message, swipe to the right. To call back that person, swipe further right. To delete the message, swipe to the left. One of our newest features - Contact Cards! It's a revamp of the traditional contacts list with additional features that makes it a powerful tool. Tap on the Contacts button at the bottom. It is blue-colored and the icon resembles a silhouette of a person with two people in the background. To add a new contact, tap on the blue figure with a + near the top. NEW! Quickly scroll through the contacts list by dragging your finger on the ABC column on the right side. NEW! Order icon above the ABC column lets you sort the list from A-Z or Z-A. To call a contact, swipe to the right. To edit a contact's details, tap on an existing contact to see their contact card. Then tap on the Edit button at the top right corner. Its icon resembles a notepad with a pencil on the top of it. NEW! You can add tags to new and existing contacts. Tap on Edit (for existing contacts) and you will see a [ + ] button right under the person's name. You can also set the default language (ENG or ESP) for that person. Tags help narrow down results when you type in the Search field. The ONLY VRS app that fully utilizes the wondrous world of RGB goodness to grab your attention using your favorite color! Tap on the hamburger icon at the top next to the Search field. It looks like three small horizontal lines that are stacked on top of each other. This takes you to the Settings. Tap on Lights. If this is your first-time setup, you will be pressing the button on the top of your Hue Bridge. If it's not found, tap on Search to manually enter the IP address. Once you've successfully established a connection between the Convo app and your Hue Bridge, you can finally customize your lighting experience in there. We wouldn't want you to miss calls or unread messages, would we? Go to your iPhone's Settings. Scroll all the way down until you see a list of your installed apps which will be in alphabetical order. Tap on Convo. Make sure ALL of the buttons are enabled to be safe (Camera and microphone). Then enter Notifications. In there, make sure Allow Notifications is enabled. It is recommended that all types of Alerts to remain enabled. Sounds and Badges needs to remain enabled. If notifications aren't working for you after all these steps, make sure Do Not Disturb isn't enabled. Its icon resembles the moon and can be found in the Control Center where you control the screen brightness, enable the flashlight, et cetera. If all else fails, you may want to consider reinstalling the app and rebooting the phone. Consult with customer support if notifications are still not working. The magical place to find all of your Deaf businesses/community needs! Currently, the map is disabled until further notice. Tap on the Ecosystem button. It is teal-colored and the icon looks like a map with a pin on it. You will see a list of all the businesses/communities. The list is sorted by distance automatically. The ones that are closest to you will be shown at the top. Tapping on a business entry will take you to their Contact Card, which will show the profile picture at the top, the name of the business and relevant tags. Beyond that, it will supply you with information containing their phone number + the option to call them, the website and lastly, the call history you might have with them. All-in-one support center. The only pit stop to getting the help you need! Tap on the Help button. It is purple-colored and the icon has a white-filled circle in the center with a silhouette of a question mark inside. The next thing you'll see will be four large circular buttons. 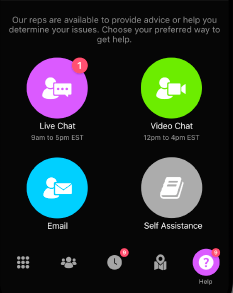 The options are Live Chat, Video Call, Email and Explore Topics. Live Chat is text-based and will notify a live representative during business hours. Outside of that, you will have the ability to leave messages and the support team will get back to you as soon as possible. Video Call is VP-based and you will be connected to a live representative during business hours. Outside of that, you will have the ability to leave Videomail and the support team will get back to you as soon as possible. Email is also text-based, but more reliable. Once Live Chat is unavailable, it falls back to e-mails. If you leave Live Chat before the representative responds, you will receive a response in your e-mail inbox. Explore Topics is good if you are feeling adventurous and confident. It allows you to browse through the knowledge base to learn more about our products or find FAQs. The place where you go to tailor your own user experience. 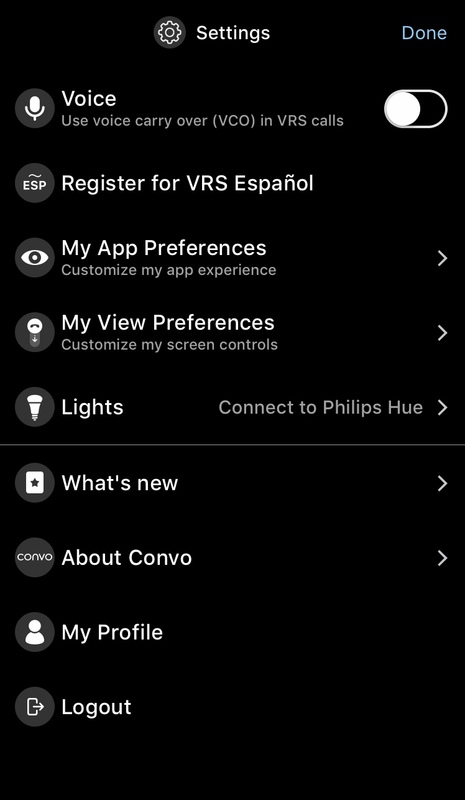 The main user experience options are; Voice, Register for VRS Español (if you haven't registered for your VRS Español number), VRS Spoken Language (if you already have your VRS Español number), My App Preferences, My View Preferences and Lights. The miscellaneous options are; What's new, About Convo, My Profile and Logout. A more in-depth explanation for each option will be available in the paragraph after the next one. VRS Spoken Language - This allows you to choose your default language as Spanish or English. 1.) HIGH CONTRAST - Disables transparency across the entire app. 2.) MY MIRROR - Shows a live feed of yourself. 3.) CALLKIT - Allows you to toggle between Callkit and Classic. 1.) 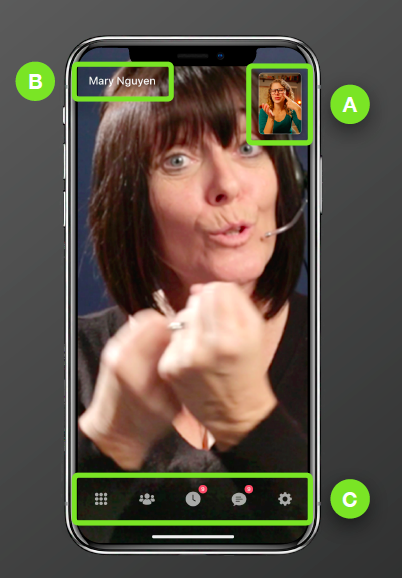 VIDEO ZOOM - A toggle that basically zooms in the person's face. Lights - This allows you to connect to the Hue bridge (first-time setup) and to customize your lights (after the first-time setup). About Convo - This contains 5 options and shows the app's version at the top. 1.) LIKE US ON FACEBOOK - Visits Convo's Facebook page. 2.) RATE OUR APP - Opens the App Store to rate our app. 3.) VISIT OUR WEBSITE - Visits Convo's main website. 4.) TERMS & CONDITIONS - Legal information can be found here. My Profile - It will take you to the Profile page. Logout - This logs you out. If you still have issues or have questions, contact Support.